I left the Prince Edward Theatre deeply moved and although I didn’t feel like I would never be able to listen to Kim Wilde or Blondie again, I clearly felt that Evita was music of a different kind. However, it wasn’t until I went to University that I followed up upon those first experiences with classical music by the likes of Stephanie Lawrence & Dennis O’Neill. Thus, Wagner proved to be pretty cool and so I went to the library, then still at the Prinsengracht, to borrow a biography of the man. To my astonishment, these excerpts turned out to be only tiny parts of much longer works, and so I went back to Concerto (I’m not sure if Joop was then already selling records there, but he could have been) to get me a 'complete work by Wagner'. Another name that came up again and again in Wagner literature was that of Giacomo Meyerbeer. A fascinating composer, since anyone mentioning his name accoladed it with the exclamation that this guy was in fact the most popular composer of the 19th Century! Regardless, I though that French Grand Opéra couldn’t hold a candle to the one Italian source of inspiration for Wagner: Bellini’s Norma. To begin with, Norma was clearly the most beautiful opera ever written. Secondly, Norma routinely seems to mark the moment in time where any starting opera enthusiast is introduced to the voice of... Maria Callas! Because all those obscure live recordings didn’t always have an elaborate booklet, I decided to buy a book with synopsises. Like many before and after me, I ended up with Leo Riemens ‘Great Opera Book’. Some synopsises triggered my imagination to the point where I spend decades to find a recording. Rusalka! Now that was a story! Of course you could eventually find the Supraphon recording of Dvoraks version, but that didn’t keep one satisfied for very long. No matter how beautiful that ‘Song to the moon’ was, it was already there, while you still didn’t know how that legendary Melodiya recording of Dargomiszhky’s Rusalka sounded, since it was then impossible to find. It wasn’t until halfway the nineties that I found a copy in a museum in Krasnojarsk, Siberia. 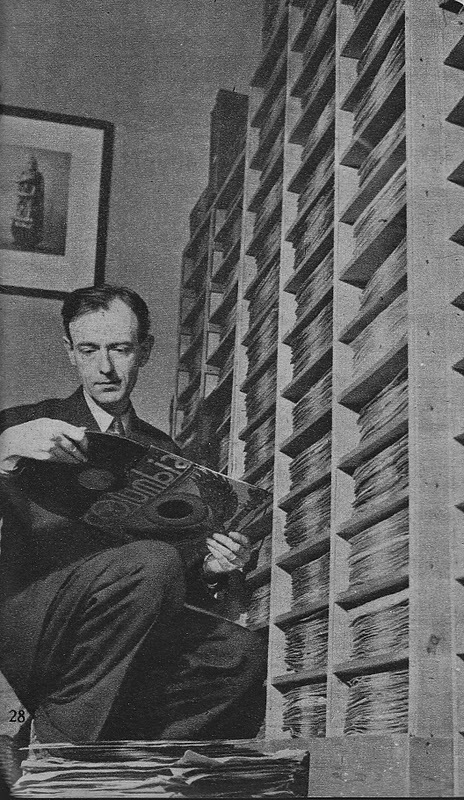 When I told the director of my fascination for this opera, he presented me with the records. That meant I had to drag that bad smelling LP set, which reeked after bone-glue, from Krasnojarsk to The Netherlands, but the find was worth every minute of it. In the era before the dawn of the Internet, you could never be sure to find such a recording again. For rarities like that we used to depend on the international tape exchange circuit. There, VHS and cassette tapes were exchanged with people in then still exotic places like London, Paris or New York. In the internet era, the last unfindables from Riemens book such as Ditters von Dittersdorf's Doktor und Apotheker, Cimarosa's Italiana in Londra, Bloch's Macbeth, Kienzl's Die Kuhreigen and so on eventually all turned up. Dargomyzhky's Rusalka, once the pride of my LP collection, can now be grabbed in a few mouse clicks in three or more regular and pirated editions and yet... as in the case with the French comix series Asterix et Obélix, one secluded corner remained entirely in the dark: the three Flemish and Dutch operas mentioned in the book as worthy of a place between the best orks of Bellini through Bizet to Mozart, Verdi and finally Wagner and Zandonai: the works of Jan BLoxck (Princess of the inn and The bride of the sea) and hendrik Andriessen (Philomela). During such journeys into opera recordings, one sort of got the singers along with the opera. When it concerned rarities, this wasn’t always satisfactory, although I still treasure 1950’s Supraphon singers like Ivo Zidek and Milada Subrtova. On Melodia I discovered Mark Reizen and Boris Christoff. Hungaroton surprised me with Goldmarks opera Die Königin von Saba and the voices of Siegfried Jerusalem, Veronika Kincses and Klara Takács. CBS Masterworks released Mascagni's Iris with Ilona Tokody and Plácido Domingo, along with an unmatched recording of Mahler II under Lorin Maazel with Jessye Norman and Eva Martón. The most instrumental vehicle to find great singers, however, proved to be once again Maria Callas. Within her recordings, you got Giuseppe Di Stefano, Mario Del Monaco, Fedora Barbieri, Giulietta Simionato, Tito Gobbi and last but not least... Franco Corelli as a bonus! And apart from Callas, you also had the immaculate Magda Olivero – a girl that didn’t need any colleagues at all! All those names I preferred tremendously to some other singers that Callas had to sing with for all the wrong reasons. But alas, or maybe – not alas... Because this insight proved a decisive moment in my development as an opera lover: the focus shifted from the composer to the singer. Although I will always remain a Bellini adept, I will still turn off a Bellini recording when the singers don’t give me that magic that I know I am entitled to in this music. That insight proved the starting point for a new journey. One line carried me back to singers from Verdi’s days, such as the creators of Falstaff, Iago and Otello, Victor Maurel and Francesco Tamagno. The other line went from Mirella Freni, Renata Scotto and Cristina Deutekom to the current baroque revival with Diana Damrau, Joyce DiDonato, Karina Gauvin and Philippe Jaroussky. And then there are bel canto divas and Puccini sopranos such as Angela Gheorghiu and Anna Netrebko. There were Domingo, Pavarotti and Carreras, and presently also Rolando Villazon and Jonas Kaufmann. These are largely singers that I also met in person, thanks to my work as an author for the music & arts magazines Villa d’Arte, Luister (Listen), GPD Newspapers, Opera Quarterly, or The Record Collector. As mentioned, at one point I managed to get Riemens's Great Opera book complete, except for the works by Hendrik Andriessen and Jan Blockx. The two accursed operas by Flemish composer Jan Blockx, The Princess of the inn and The bride of the sea bride proved unfindable bar a few rare Flemish Edison-cylinder recording of each, in addition to which there existed a 1958 bootleg recording of Act II of The Princess of the inn. It was not in circultion yet i did manage to get my hands on it. From the above, it will be clear that Riemens has been responsible for quite a few things in my life and even then, the above was just the beginning. Things really started having an effect on me only when I advanced to his Tosca chapter, where he writes that he possesses 89 recordings of ‘Vissi d’arte’, except the unique recording by the legendary role creator Hariclea Darclée, ‘a recording so rare that no one has ever seen it.' This remark fired my imagination to the point were to date, exactly 30 years later in 2017, I have completed Darclée’s biography. It is this ability of Riemens to fire people’s imagination, that I still admire. Long before I even started my search for the unfindable Blockx operas, I had tried some Dutch composers. Partly out of curiosity, and also because of the sometimes breathtaking cover art of the 1970's Donemus LP releases of the works of Piet and Otto Ketting, Louis Andriessen, Tristan Keuris or Ton de Leeuw. In the 1970’s. Dutch socialist subsidary culture made it possible that those releases were works of art in themselves, that you could even collect if you didn’t like the music (which was often the case). There were releases with incredibly heavy booklets, sometimes even with the complete scores inside! These recordings were mostly of instrumental music tough. Opera didn't seem to be the prime field of interest of the average Dutch dodecafonic composer (or of their publishing house). I remember my disappointment when I realised that this beautiful (well, I liked it...) new theatre was baptised with an English language piece. To speak with a pop singer of those days, that was definitely a sign of the time. I did buy the recording though, still a treasured vinyl rarity, since it was never rereleased on cd. That sad fate also befell the LP recordings of the late 1960’s opera Reconstructie and Peter Schats’ Houdini, a circus opera', my next 'finds'. In my modest opinion, Reconstructie is an underestimated conceptual opera (more about this work you can find on 401NederlandseOperas.nl), although... it took me 25 years to come to the point where I could appreciate it. Half the people dislkiked it for the music the other half, or perhaps even more soon critisized the celebration of Fidel Castro and Ché Guevara as anti-capitalist revolutionaries on their way to bring the people of Cuba and Bolivia the splendours of Marxism... Itasn't long before the visit of the collective composers to Cuba, a veritable pelgrimage, stood out as a painful testimony of their political, well, you can pick a word: naivity? Stupidity? Ignorance? Even 'treason' popped up. Those were the days. Now, post Castro's death a wave of nostalgic feelings went over the world; music publishing house Donemus even provided a free download of the Reconstructie score in tribute to the composers collective! You can pic the sign and the times here to your own liking. As for Castro, how could he not have failed with the forces amassed against him? The miracle is that he survived and persevered. Then what are we to make of Reconstructie? Well, if it is not a great 'opera' it certainly is a great piece of music theatre, antedating Kagel's notorious Staatstheater by several years... I dare say the latter would have been unthinkable without Reconstructie. Of course, these are perhaps very interesting releases for avant garde fans and musicologists but they said nothing on the lost gems of Dutch and Flemish operatic history. They aren't in a line with any other tradition than the avant garde tradition of the 1950s which broke with everything from before Worlsd War II, precisely the time from which you would expect more 'listenable' music. In my quest for Dutch operas I eventually went back to the manuscript scores hidden in such archives as NMI, MCO, KHA, TIN and others. By then I was working on a veritable anthology of Dutch operas 1678 to the present day. Since there were no recordings, I started organizing concerts with highlights from these scores. The first concert took place in April 2015, and currently we have disclosed an array of arias and duets from Dutch and Flemish operas through the concert recordings. In addition we started releasing integral historical recordings of Dutch and Flemish operas. At the time of writing, early in 2017 we are even on the verge of releasing... Jan Blockx The princess of the inn and The bride of the sea along with Hendrik Andriessen's Philomela. The latter was given to me by a Dutch collector while the Flemish titles popped up in a private archive. They existed in a single copy only, the original recordings! They weren't merely considered 'lost' such as the Philomela recording had been, the Blockx operas were considered as not having been recorded at all! The reward of all my research and work is that eventually I keep discovering things that are beyond even my widest imagination. Dutch singers fared a little bit better than Dutch composers, even though only a handful of Dutch singers achieved an international career since the dissolving of the National Dutch Opera as an ensemble theatre in 1965, and they largely had to leave The Netherlands to break into their careers. Home bred talent has been either neglected or it was recognized mostly only after international fame was achieved, which more or less goes for the likes of Gré Brouwenstijn, Cora Canne Meijer, Cristina Deutekom and especially for Eva-Maria Westbroek today. Baritone Henk Neven is emerging, while Heldentenor Frank van Aken is better known in Wagner temple Bayreuth than in The Netherlands. Most of the other 1001 names are completely forgotten, if they weren’t preserved on that immaculate 10 cd anthology of Dutch singing by the once legendary Philips label: Het puik van zoete kelen (The creme of sweet larinxes). It was this anthology that opened my ear to Dutch singers. However, as mentioned elsewhere, I needn’t concern myself about them, because they were in the good care of Joop Lindeijer and his DutchDivas website of ere. Just as Leo Riemens is my example with the anthology of Dutch Opera that I am currently working on, Lindeijer is my example with continuing and expanding the 401DutchDivas website that I inherited from him.